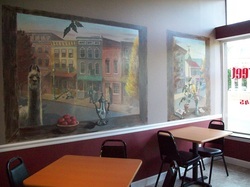 Opened May 15, 2010, Main Street Deli is a small family owned business located in the northern Shenandoah Valley in Historic Downtown Front Royal Virginia. We have been in business for 3 years and continue to grow rapidly. We have built a large client base since day one and don't fall short when it comes to bringing in business. It's a mother-daughter business with Sue Baldwin and Crystal Dolan. With some family members and friends who help out, Jessica Baldwin, Michael Baldwin, Tammy Bolt and Crystal Bosworth. We have plenty of signature sandwiches like the Club, Reuben, Italian Cold Cut and BLT. But we also have original creations specifically from Main Street Deli, like Pepper Jack & Turkey, Crazy Turkey(w/ munster cheese, cole slaw and thousand island dressing) Pulled Pork BBQ with original or spicy sauce. (sauce made locally here in town by Golden Blends BBQ) We are most notably known for our homemade sides of Potato Salad, Macaroni Salad, Cole Slaw, Italian Pasta Salad, and our most popular side which is our Cornbread Salad, which is a southern recipe with homemade cornbread, mixed veggies, beans and bacon!! We have grown into a very well established, family oriented business. So if you're driving through historic downtown Front Royal or just strolling down main street, stop in and give us a try. Trust me, you won't be disappointed. And don't forget to ask about our catering services! On May 3, 2013, Main Street Deli closed for the last time. We have been in business for 3 years and we wish the new owners the best of luck and we hope all our loyal customers continue to bring business to them.